Just think of the incredible impact telling your family and friends about chiropractic care could have on their lives. Dr. Peter Birchler has been in practice since 2006. He first worked as an associate chiropractor at other offices, then began building The Chiropractic Health Center in 2013. The grand opening was a year later, offering residents in the Chippewa, Beaver Falls, New Brighton communities a center for natural health care. In addition to experiencing chiropractic care, you can benefit from nutrition and detoxification for a full body approach to greater well-being. With these drug-free, nonsurgical options, our philosophy is Realign, Detoxify, Restore. 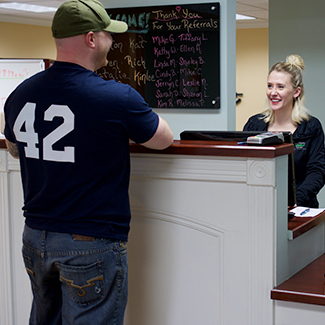 At our family-based chiropractic office, we see people with an array of needs. If you’re in pain, have experienced an auto accident, a work-related injury or want to reach the highest levels of wellness, our knowledgeable, caring team can help you. Our ultimate hope is that your body can work to its God-given potential. When you enjoy the best possible health, your entire family benefits. Dr. Birchler is well-versed in pediatric chiropractic care, and we understand that it’s easier to have your children grow up strong and healthy than to repair broken adults. As a patient at our practice, you can learn all the tools you need for you and your loved ones to live an abundant lifestyle. One of Dr. Birchler’s many young patients was a little boy who was 6 years old. He’d suffered from severe constipation from birth. He would eat, but the food would just sit in his upper gastrointestinal tract for a day, and then he’d vomit. This cycle continued for years. Bowel movements were rare. His parents estimated that they’d made about 30 trips to Children’s Hospital in Pittsburgh over their son’s lifetime. The medical doctors said the only option left was to have the boy wear a colostomy bag. Thankfully, another person suggested that it might be worth talking to a chiropractor. The hopeful parents took their son to see Dr. Birchler. Within two adjustments, the boy could go to the bathroom normally. He stopped taking the four medications the doctors had put him on that weren’t having any effect. Two visits to the chiropractor accomplished what thousands of dollars and trips to the hospital couldn’t. If you’d like to find out more, contact us today! We also offer nutrition and other health-related classes that you’re welcome to attend. Just ask when our next event is being held.